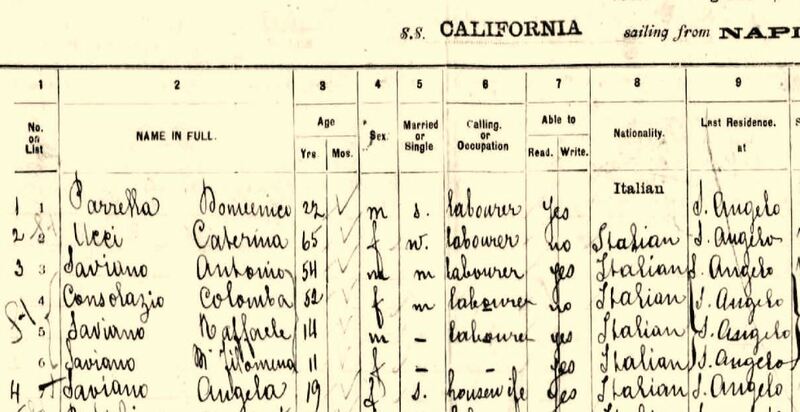 Years ago I found the 1898 ship manifest that includes my great great grandfather Antonio Saviano bringing his family to America for the first time. He had been here three times prior to 1898—once with his eldest son Semplicio—but now he was ready for the entire family to settle down for good in New York City. Antonio is my first ancestor to come to America, as far as I know. 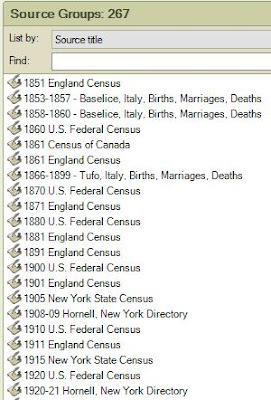 In the grand scheme of things, the fact that my earliest connection with the United States is as recent as 1890 makes me feel like a newcomer. 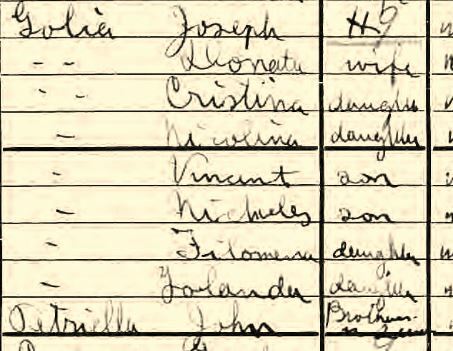 On this 1898 ship manifest beginning on line three you see Antonio and his wife Colomba Consolazio (thank you, Italy, for always using a woman's maiden name) with two of his children: Raffaele and Filomena. Semplicio was living in New York awaiting the family, and his final sibling, my great grandmother Maria Rosa, arrived separately with her husband and pregnant with my grandmother. But notice Angela Saviano on line seven. 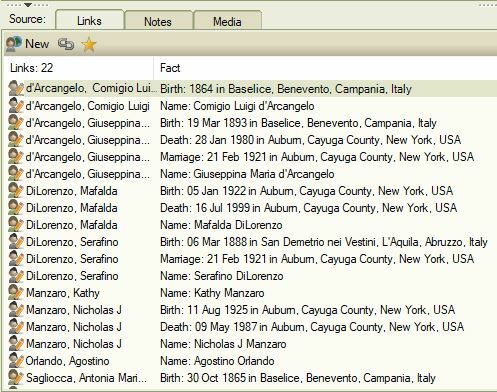 She is not Antonio's daughter, and the manifest says she is going to join her cousin Semplicio Saviano. So Angela is a cousin I didn't know about. I decided to try to find out more about Angela, but the trail went cold very quickly. Much later I was exchanging information with my mother's third cousin Rita who claimed to have Saviano roots. 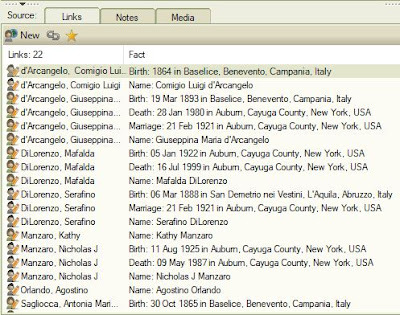 It turns out that Angela Saviano was her grandmother, and she died shortly after coming to America. So the mystery cousin turned out to be a key link to a cousin we could not previously place in our family tree. But it gets even better. On that same manifest on line two is a 65-year-old woman named Caterina Ucci who is from the same town as my Saviano family: Sant'Angelo a Cupolo, listed as S. Angelo on this manifest. 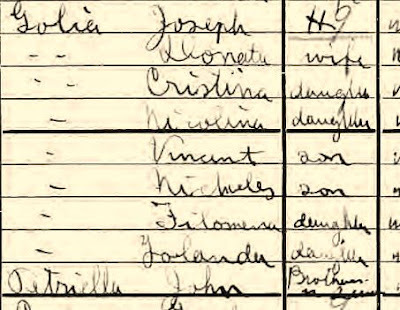 While Angela was single when she left home in 1898, she did marry and have a daughter by late 1899. And here's the fun part: Angela married the son of Caterina Ucci. That's why I always take a look at the surrounding names on a ship manifest—especially when they're from the same town as my ancestor. With a little more research I found out why the trail on Angela Saviano had gone cold. She died in June 1901 of a heart valve problem. 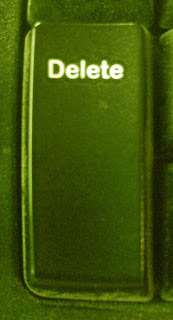 I saw her death certificate at the New York City Municipal Archives. 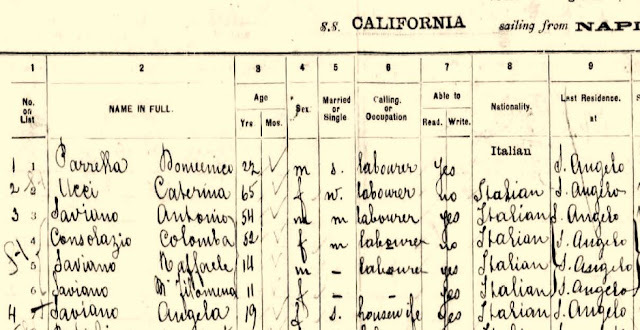 It seems so unfair for this 19-year-old girl to have made that two-week journey across the ocean in 1898, married by early 1899, had a baby in late 1899, and died in mid-1901. 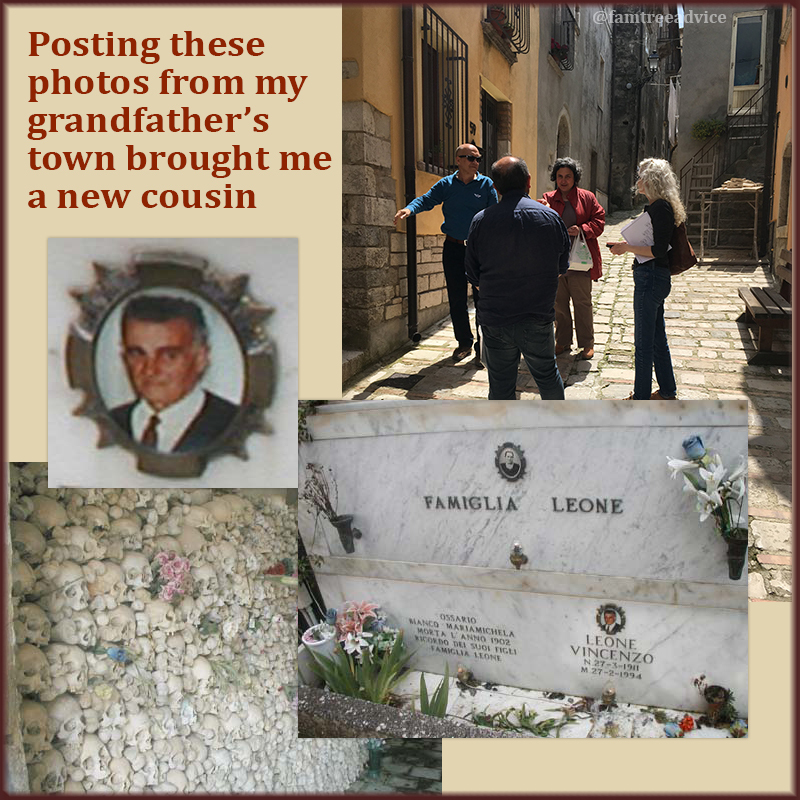 What makes me happy is that her grandchildren were always referred to as our Saviano cousins despite having never known young Angela Saviano. There's Donata's missing brother John! Do you trace your direct-line ancestors only? 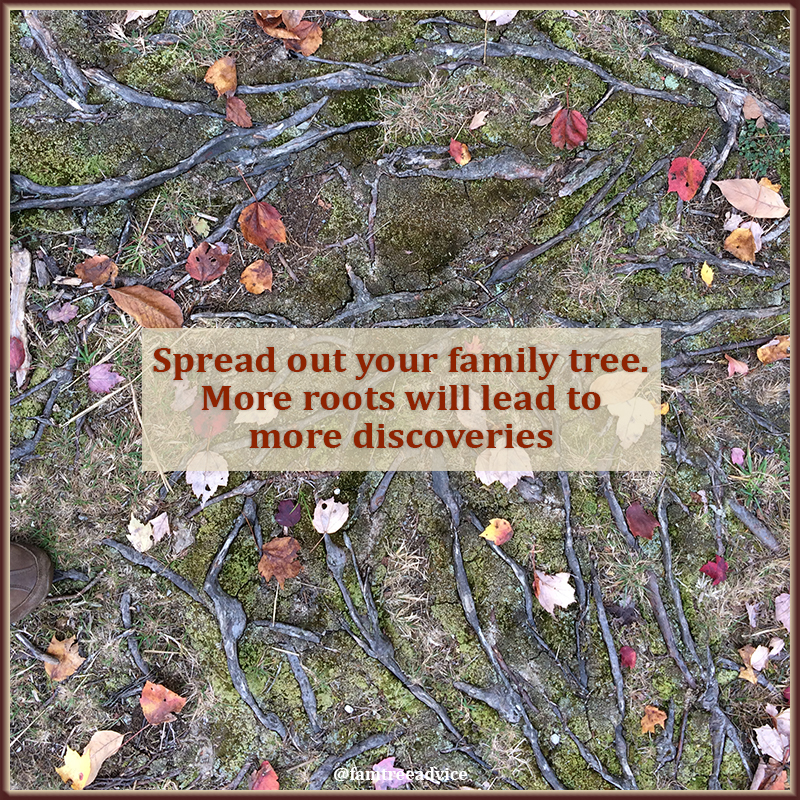 Or do you explore other branches and in-laws when working on your family tree? I believe strongly in gathering as much information as possible and presenting a more complete timeline for each family in your tree. Most of my ancestors simplified my genealogy research by coming to America in a relatively short time span, and living within a few city blocks of one another. Recently I was tracing one ancestor's sister through the years in census forms. In one census I found her brother Giovanni living with her. Giovanni had been missing to me, and he wasn't showing up in a search for his name. If I hadn't been tracking his sister, I might never have found Giovanni. 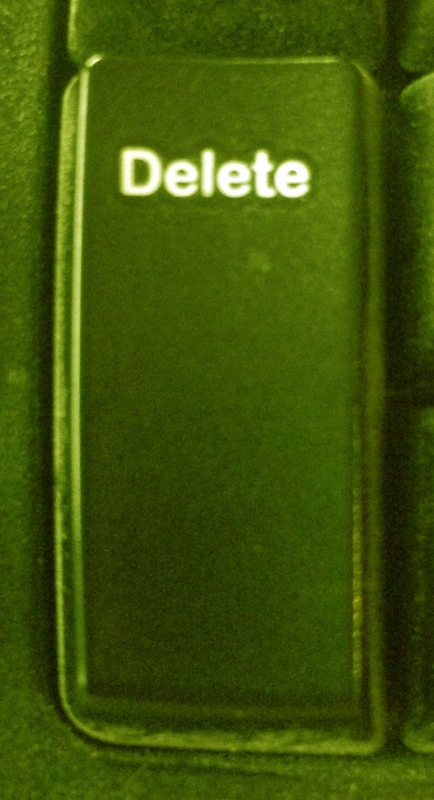 This is also a good way to find a widowed ancestor. When following the records for one of your great aunts or great uncles, you may find your widowed great great grandmother living with them. That helps narrow down the stretch of years when your great great grandfather died. I guess you could say I prefer my family tree wide like a maple, not tall and thin like a spruce. 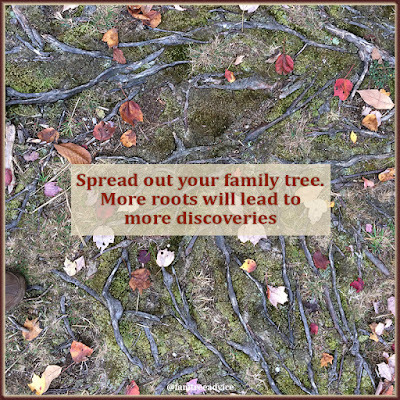 Spread out and see how your family tree flourishes.